After so many years in Delhi, I've finally understood the problem with a narrow pair of eyes. It stops others from seeing you too clearly. Which is why the big-eyed cops of the Delhi Police mistook Manipuris and Nagas, Mizos and Khasis to be Tibetans, and asked them for a passport in their own land. These people, they failed to make out in bright daylight, just happen to be citizens of our country. In fact, some of these distant states are so much in India without really being a part of it that many over there, tired of the inescapability of it all, would now like to actually break away. Apart from the fact that we should increasingly be getting used to the idea of more and varied kinds of protests - over Facebook, Twitter, as graffiti, through blogs and mass text messages, even desi versions of WikiLeaks; the candle-holding and placard-waving is, of course, always there - what was most striking about the attack on north-easterners by cops fearing trouble during the BRICS meet was that there was no apology after the affront. The courts did frown, censuring the police for "racial profiling" and for sending a bunch of Tibetans, most of them young students, straight to jail. But it is not just the cops who are doing the racial profiling. That is truly India's default setting. The moment someone doesn't fit the general - mainstream, middle-India, call it what you will -specifications of cuisine, costume and culture, the three deadly Cs that can immediately make you invisible in a crowd, persona non grata, the labeling begins quickly, frenetically and loudly. It makes a vice-chancellor of a university in Hyderabad say that the trick to control use of drugs in the campus is to start with a Sema and not a Shah. It makes a room full of seemingly decent people in a Delhi office suddenly go tribal-hunting, cracking dog-meat jokes along the way. It makes landlords turn away tenants in Chennai, and taxi drivers charge exorbitant rates in Kolkata. Things are bad now. But they were worse till even a decade ago. The enormous number of people from India's northeast, along with the thousands who have migrated from Darjeeling and Sikkim each year in search of food, security and career in the booming hubs hundreds of miles away, have after all these years made our movies, music, sports and business sectors, especially the service and BPO industries, begin to acknowledge their presence. Often grudgingly. So we have lead characters with names like Phunsuk Wangdu, a Ladakhi, in one of our biggest films of all time. And we have the Shillong Chamber Choir perform across the country and abroad to ecstatic applause. But even here we sometimes get things wrong. An article in a national English daily (i'm not too sure if it wasn't my own TOI), Meiyang Chang was mentioned as a shining example of the north-easterner's successful foray into national consciousness, with his tentatively successful stint as a singer, TV host and bit-role actor in Hindi movies. 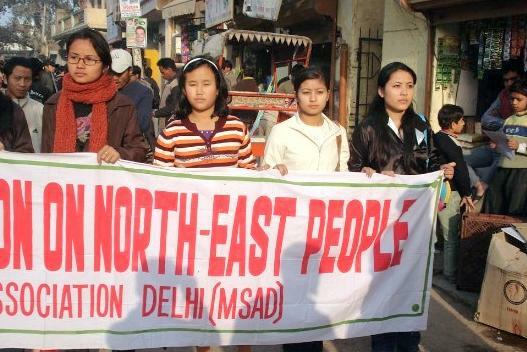 The truth is that the Chinese boy is from Dhanbad which, unfortunately, is not a part of the northeast yet. Beijing would have been upset at the blatant appropriation had not Indian reality shows with Chinese-origin people been so low on its foreign affairs priority index. That happens all the time - in Agneepath, there is a scene in which Priyanka Chopra presents 'Chinese' girls for her beauty parlour to appreciative mohalla-wallahs in Mumbai. When Hrithik Roshan speaks to one of them asking where she is from, she replies in Nepali. How does it matter seems to be the point being made. A Mizo is a Khasi is an Arunachali is a Tripuri. To be fair, though, the fact that these regions and their people had been practically closed to, and from, the rest of India till even the '80s and the '90s, doesn't make it easy for populations in our other towns and cities to deal in appropriate ways with this group of completely different-eating, different-talking and different-looking men and women. The exodus, nonetheless, has begun and is only getting more urgent with time. We might as well get used to it and give them the space and dignity they deserve. We can start by not asking them for passports, by not calling them 'chinkies', sometimes even 'chowmein' and 'momo', by not confusing them with Asians and other Mongoloid-featured foreigners, and by not cracking bow-and arrow jokes in our ties and suits. A day after a Tibetan succumbed to his injuries after he set himself ablaze ahead of Chinese President Hu Jintao’s visit to the Capital for the BRICS summit, the Delhi High Court stepped in on Thursday to ensure protection of human rights of all individuals, including protesting Tibetans, and restrained the police from treating those detained as criminals and lodging them in Tihar Jail. A Bench of Acting Chief Justice A K Sikri and Justice Rajiv Sahai Endlaw also ordered the police to immediately stop “indiscriminate hounding of Tibetans in the national capital”, and asked them to immediately shift the detained persons from Tihar to Ambedkar Bhawan if they were not released by Friday morning. “They are not criminals and cannot be treated like them. All of them have been arrested under a preventive order. It is the duty of the police not to harass people in the name of maintaining law and order in the city,” said the bench. Advocate Anant K Asthana and other lawyers had brought up the issue before the bench on Thursday morning, seeking imminent attention of the court. They pleaded a judicial order was required to ensure that basic human rights of the individuals are not violated. “People from India’s Northeastern states and those from Ladakh are scared to step out of their houses while police go on the rampage to detain and arrest everyone who has any resemblance with Tibetans,” Asthana contended. Taking on record his submissions, the court had subsequently called upon Pawan Sharma, the standing counsel for Delhi Police, and asked him about the police actions. Sharma assured the court that he will pass on all requisite directives to the department, and will ensure there was no harassment. “We will also release all those detained at 10.45 am tomorrow morning,” he told the court. The court also permitted a group of lawyers to meet those persons who were arrested and lodged in Tihar Jail, or detained in police stations, to find out whether they are from Tibet or the Northeast, and also separate the juveniles from them. The court, however, refused to restrain police from detaining the Tibetan protesters to maintain law and order. Two days before Chinese President Jintao’s scheduled arrival in Delhi for the BRICS summit, 27-year-old Tibetan activist, Jampel Yeshi, had immolated himself during a protest at Jantar Mantar. He died on Wednesday.